The dish has traditionally been considered Ukrainian in origin since its name comes from Kiev, the capital of Ukraine. However, the Russian food historian William Pokhlebkin claimed that Chicken Kiev was invented in the St. Petersburg Merchants’ Club in the early 20th century as Novo-Mikhailovsky Cutlet, and was subsequently renamed Chicken Kiev (котлета по-киевски, kotleta po-kiyevski, lit. ‘Kiev-style cutlet’) by a Soviet restaurant. 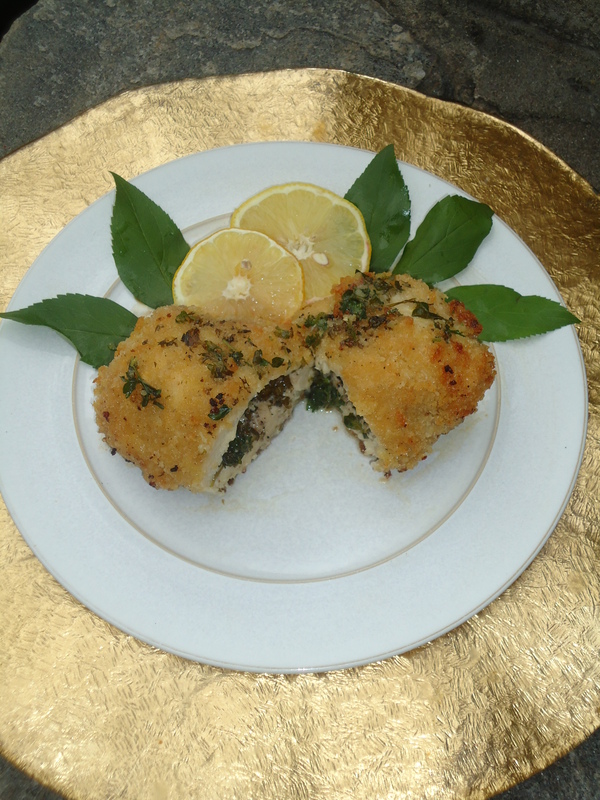 The original Chicken Kiev has a bone that sticks out like a handle, and is for presentation purposes only. When eaten, the first cut into the chicken releases a flavorful stream of hot butter which makes the chicken incredibly tender. This recipe is a modern version of the Russian Tea Room’s recipe, having omitted the bone, using skinless chicken breasts. Like with any recipe, this dish takes a little bit of preparation and some practice to get the technique just right, but it will be well worth it when you serve it on special occasions for family and friends at the dinner table. In a medium bowl, mash or cream together 8 tablespoons of softened butter with 1 garlic clove minced, 1 tbs lemon juice, 2 tbsp finely chopped fresh parsley, ½ tsp salt and ½ tsp pepper. Shape into a log ¾” thick, cover with plastic wrap and place in freezer, for 15 minutes, but over night will yield the best results. Pat dry the chicken. Remove the tenderloins from the chicken breasts.Place the chicken between two pieces of wa paper or plastic wrap. Using a meat mallet or a rolling pin, carefully pound them to ⅛” thick. Remove the wax paper and sprinkle the chicken with salt and pepper. Divide the compound butter evenly between the chicken breasts and carefully roll up and secure with kitchen twine. Coat the chicken in the flour, dip in the beaten egg and coat in the breadcrumbs, pressing firmly to make sure they stick. Return to the freezer for 30 minutes. Bake the chicken for 30 to 40 minutes or until the outside is golden and crisp. To serve, plate the chicken and drizzle a bit of the butter sauce over it before serving. Garnish with lemons slices and fresh parsley sprigs. There are almost as many ways to make guacamole as there are cooks who enjoy making it with the freshest ingredients. At the Los Angeles restaurant Bar Amá, celery puree is the secret ingredient. No one will be able to guess what’s in the guacamole, but everyone will agree it’s delicious. Another secret to making great guacamole is the use of more than enough lime juice, to prevent the browning of the condiment while being served. In a blender, combine the celery, garlic, water, and 1/2 teaspoon salt. Puree until smooth. Measure out 1/4 cup (2 fl. oz./60 ml) of the celery puree; discard the remaining celery puree or reserve for another use. It will keep in the refrigerator for up to 2 days. Cut the avocados in half, remove the pits and scoop the flesh into a large bowl. Add the 1/4 cup celery puree, the lime juice, chile, cilantro and 2 teaspoon salt. Using a large fork or potato masher, mash the ingredients until they are thoroughly combined but the mixture is not completely smooth. Taste and adjust the seasoning with more salt and lime juice. Serve immediately with tortilla chips.